Liberty Seguros went on the attack yesterday in an attempt to defend its race lead. 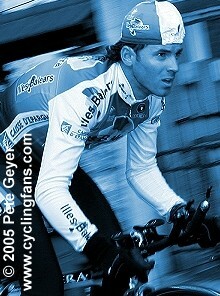 (Alberto Contador in yellow.) Andrey Kashechkin in particular put the pressure on rivals such as Alejandro Valverde and Cadel Evans with a long breakaway. He almost came away with the stage win. But in the end, Kashechkin was reeled in with less than 2km to go and Valverde won the stage, taking the bonus seconds in the process, exactly what Liberty Seguros had wanted to avoid. Contador's race lead has dropped to just 6 seconds over Valverde heading into today's final stage 20.4km time trial in Lausanne. Evans is in third at 24 seconds with Jorg Jaksche in fourth at 28 seconds. Today's time trial is on a very tough course, the same one that saw Santiago Botero win both the stage and the overall in 2005. On that day, Contador lost 1:04 and Jorg Jaksche lost 1:10. (Valverde and Evans weren't there.) If last year is a good indicator, Contador and Jaksche will have trouble getting it done today. But that was last year and Contador has yellow on his back this time around. But we might also look at the results of the 24km time trial earlier this month at the Tour of the Basque Country. 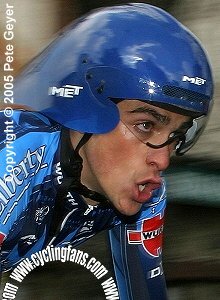 That time trial and the overall were won by Jose Angel Gomez Marchante who is not racing today. Who was in second just 6 seconds back? Valverde. Contador was 8th there, 29 seconds back with Cadel Evans a disappointing 27th at 1:18. But Evans' form appears on the rise. Valverde has practically owned the month of April. Does he have one more super performance in him on this last day of the month? He doesn't need to win this time trial but he must best Contador by 6 seconds and hold off Evans and Jaksche. Beautiful stage win yesterday for Alberto "The Accountant" Contador. (contador = accountant in English) Contador finished the stage 24 seconds ahead of Alejandro Valverde and Cadel Evans. 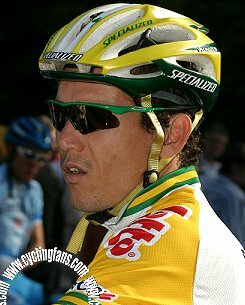 He also took the yellow jersey and leads Valverde in the overall by 16 seconds. Contador's teammate Jorg Jaksche is currently in third at 28 seconds. 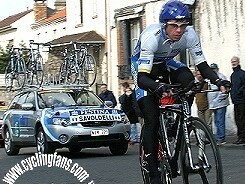 Previous race leader Chris Horner dropped to 9th overall at 57 seconds. Paolo Savoldelli lost nearly 12 minutes yesterday and is out of contention. Savoldelli is looking ahead to the start of the Giro d'Italia, which starts next weekend, where he will be defending champion. With three riders in the top 6 (Andrey Kashechkin is 6th at 53 seconds), Liberty Seguros has a great shot at winning this race. Today's tough mountain stage features three category 1 climbs. Whoever remains in contention after today will battle it out in tomorrow's final stage time trial. 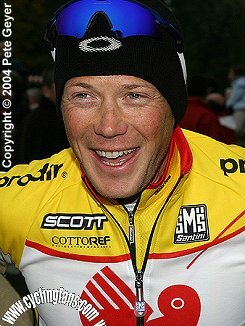 When American Chris Horner signed a contract for the 2005 season with Saunier-Duval, for a second chance at big league racing in Europe (he dominated U.S. domestic racing after an earlier stint in Europe with La Francaise des Jeux), he was so eager to get going that he suited up in Saunier Duval colors at the Paris-Tours race in October, 2004. He was back. And very happy about it (photo). 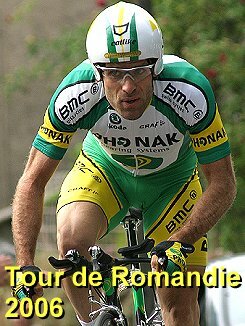 After an injury early in 2005, Horner came back with some very strong performances, including a stage win in the Tour of Switzerland and a near stage win in his first-ever Tour de France. He seemingly has been in the mix in every one of his races since. 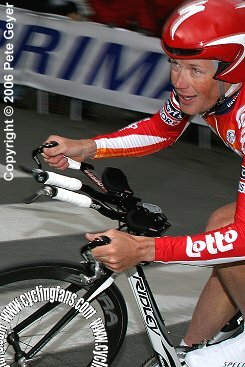 Now with Davitamon-Lotto, Horner is once again riding with the best. Yesterday he attacked an elite group of riders, including Alejandro Valverde and race leader Paolo Savoldelli, and held them off to win the stage, taking the race lead in the process. Great racing. Savoldelli and Valverde are now 7 seconds back. Tough mountaintop finish today. If Valverde wants to win the overall, he needs to do a number today ahead of Sunday's time trial where Savoldelli should have the edge. Swiss Alexandre Moos of Phonak is 4th at 9 seconds back. He won't give up without a fight in his home race. Robbie McEwen (Davitamon-Lotto) did yesterday what is expected of him just 10 days before the start of the Giro d'Italia -- show he's ready to take on Alessandro Petacchi. McEwen won the stage, Paolo Savoldelli of Discovery Channel is still in yellow. 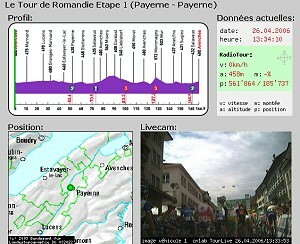 During last year's Tour de Romandie, we introduced you to Swiss Cnlab's "Romandie Live" coverage. They're doing it again this year, providing live still images, dynamic race map and profile updates, and live data from Radio Tour including speed, altitude and % gradient. You'll find cnlab's "Romandie Live" link in our "Live Guide" below. Paolo Savoldelli of Discovery Channel is clearly in form just 10 days before the start of the Giro d'Italia, where he will be defending champion. Savoldelli won yesterday's prologue, ahead of Alejandro Valverde and Bradley McGee. Note: If you have Germany's DSF channel, they are showing the Tour de Romandie live this week (Thanks for the tip, MJ Ray!). Sport+ is showing this race live in France. Eurosport is not broadcasting Romandie, thus no live audio streams. There are a lot of big names in this important race before the Giro d'Italia, including Bobby Julich, Paolo Savoldelli, Thomas Dekker, Erik Dekker, Jan Ullrich in his first race of the season, Cadel Evans, Robbie McEwen, Chris Horner, Wim Van Huffel, Fleche Wallonne and Liege winner Alejandro Valverde, Oscar Pereiro, Alberto Contador, Jorg Jaksche, Andrey Kashechkin, Bradley McGee, Haimar Zubeldia, Stefano Garzelli, Dario Cioni and Francisco Mancebo. Use of any of this site's content (or content of mine found elsewhere online) without my written permission is expressly forbidden. If you have a request, e-mail me.